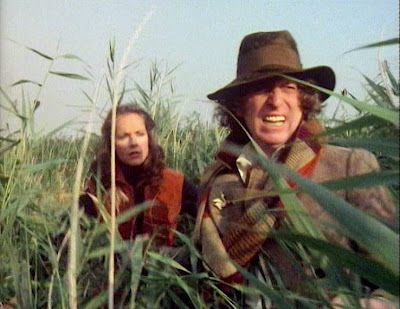 The Doctor and Romana get mixed up in gun-running on Delta Magna and a dispute between the Swampies, the local population, and the coniving methane refinery personnel. Oh and a big quid has swallowed the fifth segment of the Key. Ho hum. Was Robert Holmes having an off day? Or was it just the way his ideas were executed by the production team at the time? Whatever happened, it makes Kroll the first serial of the Key To Time sequence to let the side down. The season's been going great guns up until now and then everyone drops the ball and the whole season screeches to a halt and ends with the damp squib, or should that be squid, of Kroll and the interminable dullness of The Armageddon Factor. 'Tis a pity too as there's a rather terrific cast here - Philip Madoc, John Abineri, Neil McCarthy - and a healthy quota of location filming that has a fresh appeal - love the TARDIS almost buried by the reed beds. But then we get endless scenes in the rig control room of people pointing at screens muttering 'look at the size of that' or nameless extras in awful green body paint and Bo Derek hairdos all running about trying to escape the rubbery clutches of said titular beast. ...an attempt to talk a little more seriously about 'home rule' and colonialism. In the middle of all the rather lame production values (the rig sets are spartan to say the least and the rocket silo is embarassingly wobbly) and the green painted actors, there is an interesting story with some typical Holmes observations about criminality and the nature of revolutions as well an attempt by the series to deal with a native society's blind faith in their God. It's now all a bit tokenistic but at the time it was an attempt to talk a little more seriously about 'home rule' and colonialism. The last time anything like this was on the menu was with The Mutants back in 1973 and we all know how that one turned out. Madoc and Co do their best with quite dreadfully dull parts, especially as they are mostly confined to a bare looking set trying to make green blobs on a screen all the more threatening. It's a terrible waste of talent. John Abineri makes the most of his role as Ranquin and gives it all he's got and is convincing as the old leader set in his ways. And John Leeson gets a brief moment in the sun as Dugeen, haplessly twiddling knobs and listening intently to his earphones to convince us that Kroll is a very big squid indeed! Glyn Owen as Rohm Dutt provides us with his standard gravel voiced, hard bitten mercenary type and looks quite at home traipsing through the reed beds of East Anglia. There's also a lot of getting captured, running around, and getting captured again. And that includes the Doctor and Rohm Dutt as well as Romana. Baker and Tamm have some good lines and offer a lightness of touch that is a little misplaced. This isn't Androids Of Tara where such lightness helps keep all the elements moving. A King Kong moment that's badly scuppered. When Kroll finally does make its appearance, the miniature work is severely hampered by a decision to use a simple split-screen technique to incorporate it into the location footage. The puppet version of Kroll is fine but it's the way the finished footage collides with the vistas of East Anglia that detracts. But that is down to budgets and time for you. It isn't the worst visual effect in the series but it isn't the best either. A shame, because the location footage of the Doctor and Romana furiously rowing away across the marsh land is pretty evocative. A King Kong moment that's badly scuppered. Inevitably, there's a potentially interesting story trying to get to the surface but the characters that populate it are earnest and dull, much of the time is spent describing events that are going on (the rig control room being the major culprit here) rather than actually showing them. A constraint of the budget that's painfully obvious. In its favour, it has some great location work and the Kroll puppet is OK but also the fact that Kroll is the fifth segment is signposted rather early on in the narrative. Probably best watched whilst excessively drunk. You can join in the sacrifical dance, knock over a few ornaments and annoy the neighbours. And so we reach the close of the Key To Time sequence and the finale of Season 16. I shall try to be charitable. Indeed, I was quite disposed to being charitable about the first three episodes of this story until it all went so wrong from episode four onwards. And it kept going on and on and on. Just like the time loop the Doctor traps the Marshall in. Like any Bob Baker and Dave Martin script, there are so many lovely ideas here but they did have a tendency to use all of them, all at once and briefly and then discard them without really knowing how far to continue them. And we get six episodes of this approach when quite clearly four would have been quite suffice. 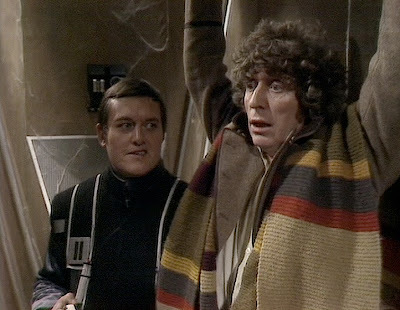 The Doctor and Romana find themselves caught up in a war between Atrios and Zeos and going in search of the final segment of the Key, discover that key players are being manipulated by the Black Guardian's agent, the Shadow. Baker and Martin's bumper book of sci-fi favourites really does get off to a reasonable start. The faux soap opera that opens the first episode is a clever meta-textual device that brings us into the drama proper of badly run medical wards full of the victims of war. Their take on propaganda is apt for a story that concerns itself with subterfuge, bluff and counter-bluff between the twitchy Marshall, played with great authority by John Woodvine; the Shadow, with William Squire striving to be villainous despite wearing what looks like a pair of ladies tights on his head, and Princess Astra, a shop dummy that's wheeled onto the set occassionally and here introducing Lalla Ward to the show. The first three episodes are interesting in the way that they generate the narrative and keep us interested with neat twists even though the production looks like ten pence was spent on it. The production design isn't this serial's strong card and neither are the costumes and when everything turns into running around caves and corridors from episode four onwards then there's little else to keep you amused. This is supposed to be a war story told on a huge scale and it simply doesn't play well confined to these drab sets. The plot spirals off into a sub-narrative involving Drax, another renegade Time Lord, played by Barry Jackson as some sort of Cockney geezer, taking us further down the route of demystifying the Time Lords but in a truly awful way and a computer, Mentalis, that's running the war...blah...blah...blah. The choices that the actors make here seem to suggest a director who just couldn't be bothered to give notes and took the money and ran. Likewise, David Harries' little turn as the Marshall's aide, Shapp, who decides he's in a panto and has to turn the character into a total buffoon and adds in a lot of unnecessary pratfalls and slapstick. It also betrays some of the lack of confidence behind the scenes with a revolving door for the script editor post after Anthony Read jacked it all in. Graham Williams was absent too, due to illness, and David Maloney stepped in to handle the producing duties temporarily. It feels like a rudderless production and one assumes that without Maloney we may yet have had another Shada on our hands. Despite the paucity of production values, some of the model work is very good and the shrinking effects for the Doctor and Drax are handled quite effectively. It's just too bad they're driving a lame script. Woodvine and Squire make the best of a bad bunch of dull, uninteresting characters and Baker and Tamm seem to spend endless scenes re-explaining the plot to various characters, notably Astra and her very wet boyfriend, Merak. It's not a particularly fitting end for Tamm and that's a shame as up until this point I felt she had acquited herself well. Baker's on autopilot and then helps himself to a huge slice of ham for the eye-ball rolling conclusion. Cue randomiser and Romana's regeneration. 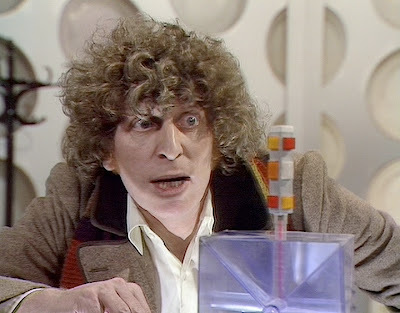 Six parters were notoriously difficult to produce and this effort and the disaster that befell Shada brought the tradition of concluding each season with a six part story to a close. There are very few totally successful stories that run for that length so it was perhaps time for a re-think. To end the Key To Time arc on such an anti-climactic note is also sad as the majority of the season can be seen as a very successful demonstration of Williams' ambitions for the show and the arc certainly worked as the glue to hold together the stories. Unfortunately, the glue wasn't strong enough here.